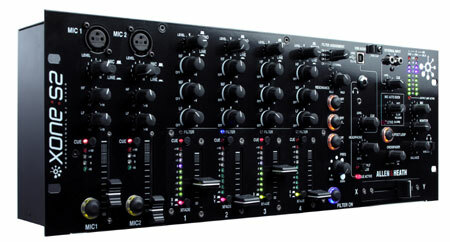 Allen & Heath Xone : S2 Fader Professional DJ Mixer DJParts - All Variety of Parts that DJ Needs. Analogue installation DJ mixer for clubs and bars Xone:S2 is a new analogue installation DJ mixer for use in clubs and bars, and by professional mobile DJ’s. 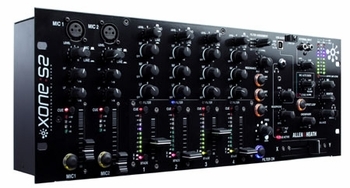 It’s a 19” rack-mount 4U mixer featuring 4 stereo dual-input channels, 2 mono mic/stereo line channels, with a choice of linear or rotary VCA channel faders, along with the legendary Xone analogue filter and a host of other functions. Uniquely, a USB audio interface is provided, enabling easy integration of digital media. The USB interface can be used for playback and recording to or from the Xone:S2 anda computer, or used with software to act like a hardware effects unit.